Save the Work, Book a Party! I can’t honestly say that I am making this post based on personal experience or even word of mouth advertising. This recommendation is being made solely on my first impression of “Sweet Impressions“. This quaint bakery, studio and giftware shop is hidden just off Pembina Highway at 669 Stafford Street. I happened upon it by accident when I was searching for a Clarinet music book for my daughter at a nearby music store. The store front immediately captured my attention and I just had to check it out! Aside from the great look and feel of the bakery, they offer something unique in that they are 100% nut free. As well, they do not use any additives or preservatives in their baking. To hear the story about how they got started and how their successful business evolved, check out their video. Of course, I couldn’t leave with out sampling some of their products! I bought a cupcake and some cookies and was very impressed with the quality of the baking ~ delicious! Despite the delicious treats and nut free environment, my primary reason for this post is because I was so head-over heals impressed with the studio in the back. I absolutely love any space that is beautifully decorated and the studio was just too cool! I loved planning detailed theme parties for my kids when they were small, but those parties seem to be something of the past as my kids continue to get older and aren’t interested in party games or themed loot bags. I’m not sure that Eden, at 12 1/2, would be interested in a cookie decorating birthday party, but for those of you have that have children interested in baking…this is seriously “da bomb”! The studio is decorated in a wonderful retro look with everything perfectly matched and so quaint! They offer birthday party packages that are completely all encompassing with everything included from cupcakes to invitations and goody bags. You simply show up and pay the bill. I honestly don’t think there could be a more perfect location for a birthday party. If you are looking for something different, that is simple, safe for all participants (nut free) and the perfect backdrop for the best party pictures ever…this is it! I didn’t have my camera with me because I was out shopping for a music book. These pictures are courtesy of the Sweet Impressions web site. I think it’s safe to say I won’t be booking a birthday party, but they do off adult decorating classes as well. Maybe I’ll sign-up for a class and learn some tricks of the trade! Whether you are looking for a special gift, picking up some allergy safe treats or booking a party, I would highly recommend checking out Sweet Impressions. It is recommended that you book birthday parties several weeks in advance to avoid disappointment. If you are one of those people who have had a party there, I would love to hear from you. Please share your experience by commenting below. I enjoy hearing the success stories of others, especially those who rise-up and take a risk, put it all on the line for their vision and beat the odds and build a successful business. I wish the gals at Sweet Impressions continue success in their venture! I looked into renting lawn signs for my husband’s 50th birthday and quickly realized that this will cost you a minimum of $100, but easily up to $200 depending on the package you get. I’m not opposed to spending the money, but I really wasn’t that impressed with some of the themes and/or the quality of the signs. If I was going to put out the cash for a day of fun at the expense of my husband, I would like the theme to at least reflect his personality or something. In the end, I thought I would much rather do something simple like birthday candles and just make them myself. The first thing I did was purchase 8 sheets of large tag board (28″ X 22″) from the dollar store (I think they were 50 cents each). I then divided the sheet by measuring and marking it every 4″ all the way across the 28″ width. So, I ended up with 7 four inch columns per page (I only needed to make one from the 8th sheet). I then used a combination of tape, paint and markers to make a simple design that ran across the whole page. This meant I only had to decorate 7 full sheets (+1 one more on the 8th sheet) instead of 50 individual candles. Once the sheets were decorated and the paint dried (if applicable), I placed 2 sheets together and cut through both layers to make 7 individual rectangles (candles) per sheet. When this step was complete, I randomly cut the tops of the candles into flames. I didn’t worry too much about the exact flame shape as I figured the finished look would be nothing more than a quick look as you drove by. You can see the cut out candles below. The next step was to paint the flame (with dollar store acrylics). I originally started with red, yellow and orange, but quickly realized I didn’t need the yellow at all. It was super simple. All I did was squeeze a few dots of each colour (red and orange) onto the flame and then drag a 2″ sponge brush through the colours to blend them. Again, no planning or special technique, just smudged the colours together. The final step was to add a wooden skewer to the back of each candle to help them stand in the ground. These were 30″ long and had a point on one end already (for piercing the marshmallows they were designed to cook). I had to buy four packages of 12 to have enough. I duct taped the skewers to the back. This helped to give the candles support and stability as well as providing the means for staking them in the ground. The skewers are not overly strong, but not one broke while sticking them into the grass. Obviously, the candles are one-sided and the effect is one most enjoyed from the street, not our front porch! Here is a close up of a finished candle. For the sign, I taped two pieces of black foam board together at the top with duct tape. I then folded them down into a triangular shape and taped the bottom edges to a cardboard water bottle flat for stability. It worked like a charm! I bought two packages of lettering and a sheet of letter stickers from the dollar store as well. I made the oversized “50” free hand. The flame look was created by cutting sheets of tissue into a circular pattern that began large and then continued to follow a circular path until the center of the circle was reached. I was able to cut several sheets at a time, so this was very quick. I did make a few different sizes of circles to vary the length. The circular cut forces the tissue to curl and gives it more of a wild flame look. To hang the streamers, I curled a few pieces of duct tape and stuck them above the steps along the top of my front porch (to the backs of the pillar tops). I then took a very long piece of duct tape (that extended the whole width of the stairs) and stuck the back of it to the curled pieces. This left the sticky side of the duct tape exposed. I then just randomly stuck lengths of the tissue streamers to the sticky tape. I’m not sure how long this took me as I was puttering away at it when I had my concussion and could only do small bits at a time. It seemed relatively easy and for the most part mindless (that’s why I was able to do it!). The most time consuming was probably cutting out the flames, but I don’t think it took me much more than an hour. Although I don’t know the exact cost, I estimate it cost me about $12 – $15. I did have the paint and tape on hand already. Aside from the savings, it was fun to sneak around working on my secret project and felt good to do something special to show Tim how much we love him! If you missed the original post, here’s how it looked when it was all set up. If you look at the top of the streamers, you’ll see the orange and red duct tape is exposed because I mounted it to the pillars on both sides. I did add a couple of pieces of tape along the top to keep it from sagging. I honestly can’t believe my husband is 50! Today is his birthday and needless to say I’ve been busy preparing for a party. I decided to just have a family party because we have 26 people with immediate family alone when everyone is able to make it. I’ve been sneaking around and secretly preparing for a little front yard surprise. I made 50 22″ candles for the yard as well as some signs and “flaming” streamers. It turned out quite well and obviously, the secret is now out and the whole neighbourhood knows ~ he’s 50! I can’t believe Shay turns 10 today and is now in double digits! I always feels like he gets the short end of the stick with a June birthday. As a teacher, I am smack dab in the middle of the busiest time of the year and my mind is totally consumed with the 46 report cards I have to write. On top of that, I have a staff meeting after school and both kids have soccer games tonight. We are trying to squeeze in a quick dinner out between my meeting and the first soccer game. Not a great day to celebrate, but I thought I could at least try to get his day off to a great start. 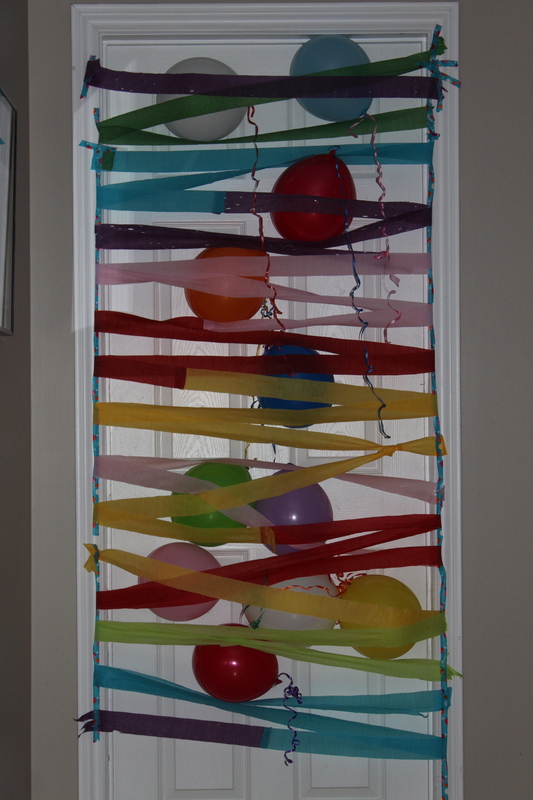 I decided to sneak upstairs after he was asleep (which meant I had to stay up late, so that was a great feat in and of itself) and decorate his door, so he’ll wake up to a surprise in the morning. I’m just hoping it doesn’t backfire, as he is obsessive about his door being left wide open and often wakes up in the night with a nose bleed. So, I am hoping he sleeps through the night and isn’t too put off by the closed door when he wakes up in the morning. Who could be upset once they get showered with balloons on their birthday? Happy birthday Shay…I hope you have an awesome day! I have posted about making invitations before, but this is about as simple as you get. You just make a full page invitation on the computer and then duplicate the page three times, so that you have a total of 4 copies of the invitation. 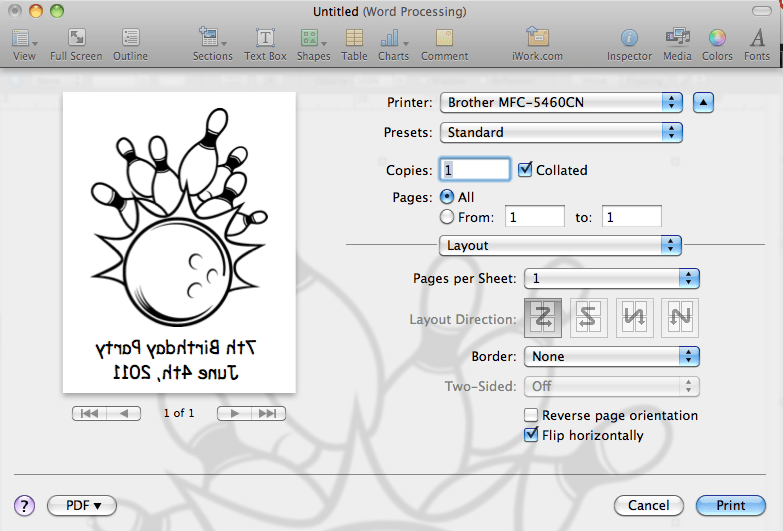 You then print it in colour on card stock and choose the printing option that allows you to print 4 pages on one page. Each invitation then ends up being 1/4 of a page in size, similar to that of a postcard. I originally tried making the invitation with a plain white background and then printing it onto black card stock, but the ink didn’t show up well. I ended up inserting a black rectangle and then “sending it to the background”, so that all of the text and lasers sat in front of the black rectangle. Of course, this meant that it used more ink to print the invitations, but when you are able to fit 4 per page, it really isn’t too bad. Here is an example of the invitation and thank-you note page I made for Shay’s party. This is an example of how to print 4 per page. This is one of the guns I bought at the craft sale. 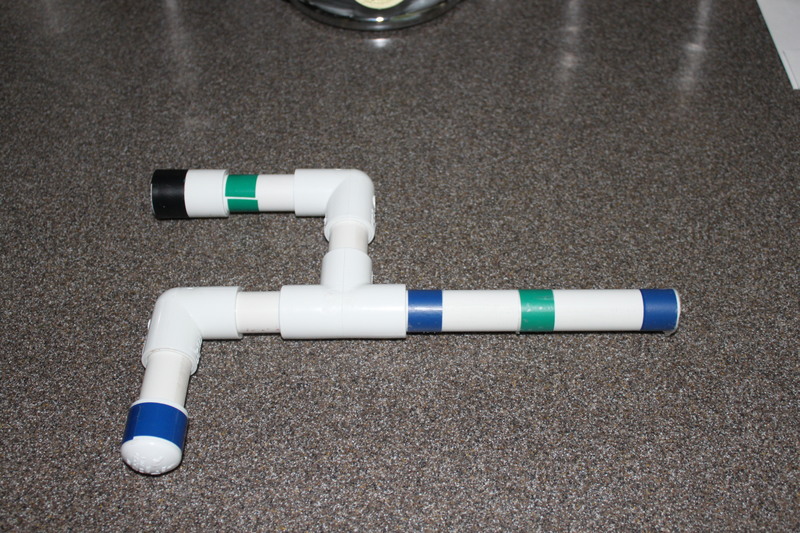 Clean the printing off the PVC pipe and fittings. I ended up using acetone that I had on hand. (Some suggested using very fine grit sandpaper, but I didn’t do this.) I then washed all of the fittings and the long pipe with hot soapy water. Cut the long tube of PVC. I used our mitre saw and it was super quick and easy. You will need: one 6″ piece, one 3″ piece and three 2″ pieces for each gun. Assemble the gun by following the diagram. I did not glue the pieces together, but simply pushed the pieces together firmly. Spray paint the guns if you wish. You can personalize or embellish the guns with coloured tape or leave them plain. This project was very simple to make. The cost was approximately $4.35 per gun, but I had the spray paint on hand. If we weren’t going to a Laser Tag facility and were having a home party, I might have given the pieces for the gun, put out some coloured tape and had the boys build and personalize their own gun at the party. However, for Shay’s birthday, we are simply giving a completed gun and “ammunition” as loot. Here are 6/10 of the guns….the rest are still drying. Wash all of the PVC pieces. Cut the pieces to the specified lengths. Assemble according to this diagram. Here are the 10 guns I made. My daughter has a January birthday which is smack dab in the middle of our harsh Manitoba winter. So, when we decided to do a “spring theme” for her 6th birthday party, it was much more about creating optimism in the middle of a cold winter than actually about celebrating the onset of spring. Having said that, it was a really fun party to plan and pull together. 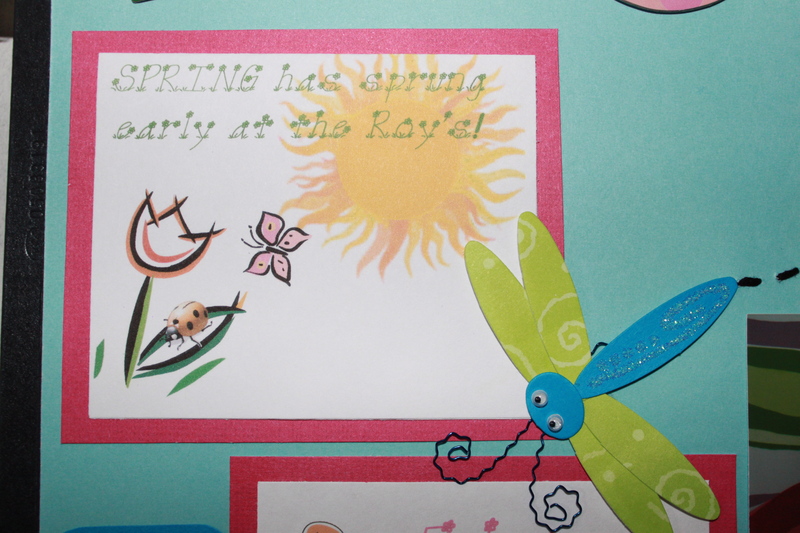 I made this invitation long before I was into card making, so it was done on the computer using a really cute “spring/flower” font and some free clip art. I tried to find the one I used, but can’t find it. If you go to dafont or font space you will be able to find something adorable to work with the theme. 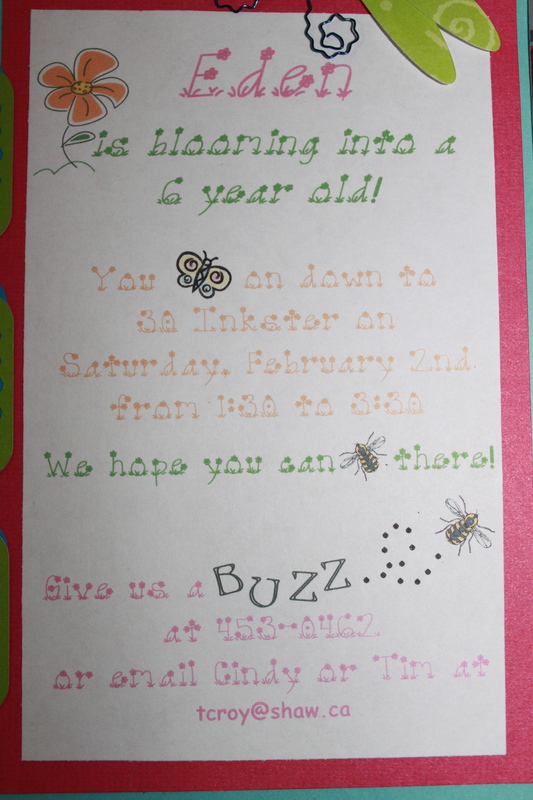 I actually tried to make the invitation Rebus style by embedding both a butterfly and a bee into the text. (I had a total mind cramp trying to remember the word Rebus for this post and it almost drove me mad!) 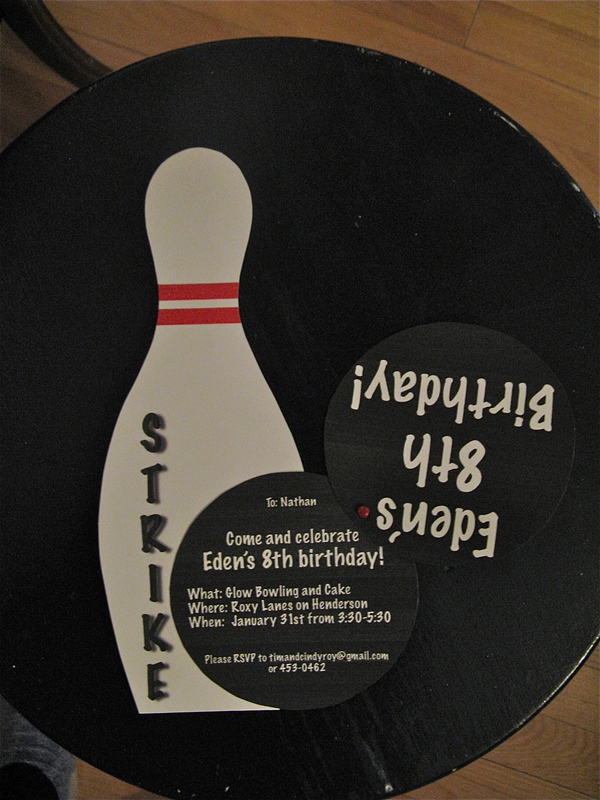 The photos below are taken of the extra invitation I printed for Eden’s scrapbook. Sometimes when I did this, I would shrink the original so that I could fit it into my layout. These aren’t the best pictures, but it gives you an idea. I made the invitation post card style, so the two photos represent each side of it. I can’t say that the decorations for this party were anything too fabulous. I painted our “picture window” in our dining room with a spring theme and had made some grass/flowers along the half walls between the living room and the dining room. I also painted black stripes on yellow balloons and then attached antennae and yellow cellophane wings. I also hung up several hand painted butterflies that I had kept from Eden’s second birthday party. To add to the theme, the birthday girl was also dressed up like a butterfly! Decorated half walls. You can actually see the loot baskets with handmade flower cookies peeking out above the grass. Butterfly Bowling ~ I filled 6 empty water bottles with tap water and food colouring to make them nice and bright. I then secured tissue paper “wings to them” and they became the bowling pins. Pin the Spot on the Lady Bug ~ I made a large poster board sized lady bug on red tag board. The kids were blind folded and given an open Oreo half (with the icing). Their job was to lick the icing and attempt to “stick the spot” on the lady bug while blind folded. They got to eat the other half. Fly Swatter Relay ~ This was so fun and hilarious to watch. The kids were divided into teams and given a fly swatter with plastic flies on it. They had to walk across the room balancing the flies and then turn around and come back without spilling the flies! When the reached the starting line, they had to carefully pass the fly swatter full of flies on to the next person in line, so the relay could continue until everyone had a turn. The kids used homemade whoopie pie cookies, licorice and icing to make their own insect cookies by adding legs and spots. Of course, they got to eat these. The girls also had their faces painted with insects and/or flowers when they arrived. I pre-printed on foam door hangers before the party. They could choose “Buzz off” or “Don’t BUG me!” and then proceed to decorate their hanger. Pass the Present ~ I got this idea from my friend Michelle. Basically, you wrap a little gift/surprise item in a box. You then proceed to add layers of wrapping paper on the outside equal to the number of kids, so that each child will get a turn to unwrap the present. You pass the present around the circle to music and when the music stops, the person holding the present gets to unwrap a layer. The person to unwrap the final layer gets to keep the prize inside. The kids love this! I can’t remember what the present was, but I am sure it was probably theme related. Here are the girls making their door hangers. Here is Shay getting ready to put his Oreo on the lady bug. Here are the pins for butterfly bowling. Here is Eden having her turn in the fly swatter relay. I always plan my parties for no more than 2 hours and keep a pretty tight schedule. It is because of this that food is not ever a huge part of the party. For this party, I put out a store bought “spring” table-cloth, plates and napkins. I also used my butterfly serving tray for snacks. For the most part the food was not theme related, but I did make small “caterpillar” fruit skewers using purple grapes and those fancy puffy toothpicks for the head. I added florist wire to the puffy head for antennae. 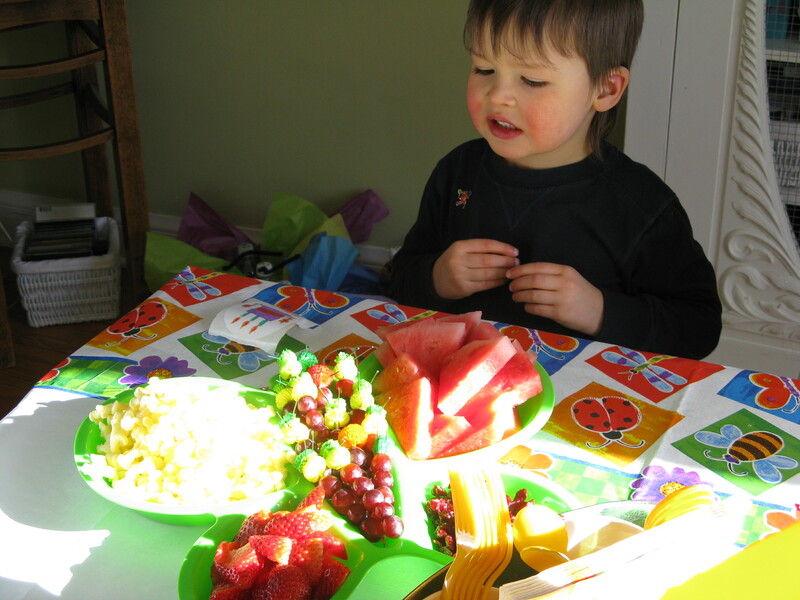 Here is Shay at the snack table. If you look closely you can see the caterpillar grape skewers. For this party, I decide to create a flower pot of cupcakes as well as an extra plate of cupcakes with a variety of embellishments on them. I loved the little birds ~ an idea from Martha Stewart. I used fondant for the flowers and added chocolate cookie crumbs for the soil. The butterflies were made with chocolate covered pretzels. I don’t seem to have a photo of this, but for the ice cream, I bought a carton of vanilla ice cream and made slices that were about 3/4″ thick. I used a butterfly cookie cutter to pre-cut butterfly ice cream shapes. I then sprinkled them with coloured sugar crystals and re-froze them on a cookie sheet lined with plastic wrap, so that they were ready to serve. This party was 6 years ago and I actually am a little miffed that I can’t find a picture of the loot baskets or an outline of my party plans. I am basically piecing this post together from memory and photos. The loot baskets were small “purse” like bags with two handles and some flowers stitched on the side. They were lined with hot pink fabric and very cute. I don’t remember exactly what I put in the bags, but I do remember that I made each of the girls a bug jar with a screen inserted in the top and a handle added. I made these for each of the girls, but don’t seem to have a picture of the jars either. 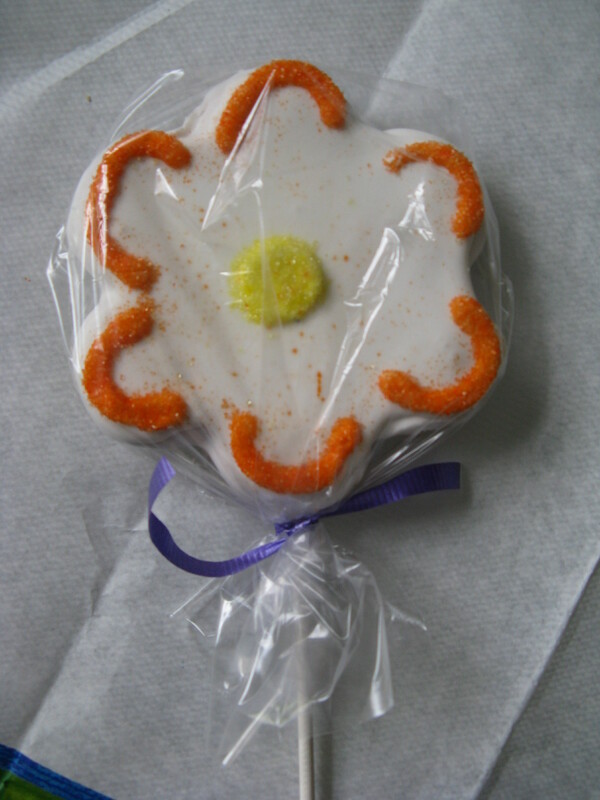 I also made them each a large homemade sugar cookie on a stick. All that I can remember is the basket, a bug jar, a large cookie and a door hanger, but I really don’t remember what else was in them. The only picture of the loot I could find! After sharing a picture of those hideous cupcakes from Shay’s bowling party, I thought I would try to redeem myself by posting some of my better attempts at cake and cupcake decorating. This was fun to put together as it took me on a trip down memory lane. I have posted a few of the details for some of the party themes I have done and will eventually get to them all. Below is a list of the themes I have done over the years. If I have already posted them, the links have been added if you are interested. Lamb Cake – this wasn’t really a theme, but Eden used to cry like a baby lamb, so we had a lamb cake for her first birthday. 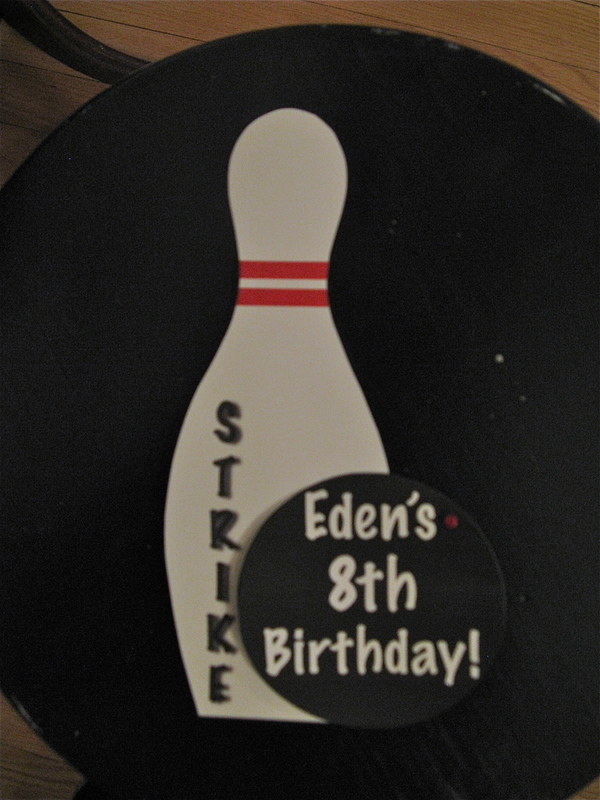 Eden didn’t want a theme for her 11th party – I think the end of this era is just around the corner. So sad. I also thought I would include the link for the basics of planning a birthday party. If you would like to view this as a slide show, just click an image and it will not only enlarge it, but take you to the slide show option. Lion Cake – This was for Shay’s 1st birthday and Eden was 2 1/2. She thought it looked so good she took a handful of cake before I was even able to snap a picture….memories!! Have you ever considered working from home? A revolutionary new training system has hit the market. If you are interested in learning how to earn money from home, you need to click this link. This turned out to be the easiest party ever! The bowling alley provided the food and drinks. I just had to bring the cupcakes and loot. 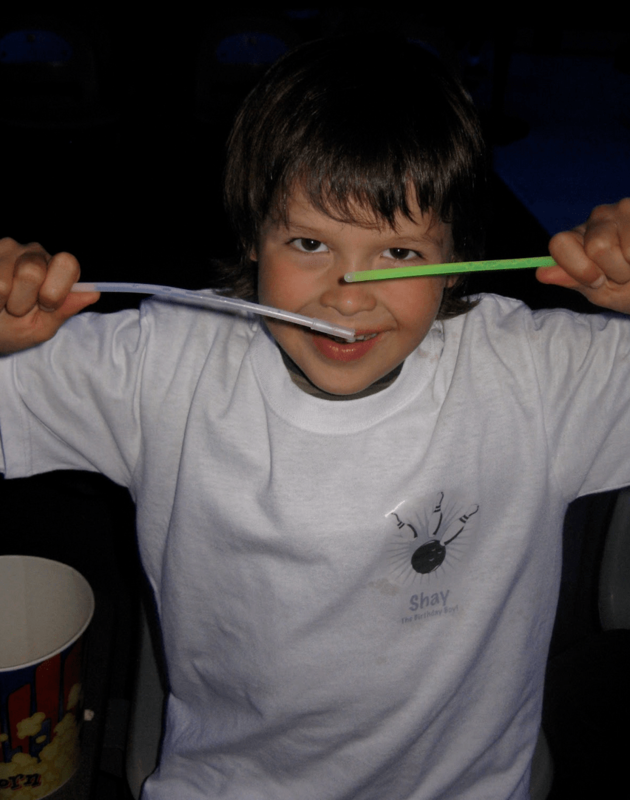 Instead of a loot bag, I made all the guests a personalized glow in the dark birthday bowling t-shirt and handed out silly bands and glow sticks that they could wear around their wrists and necks as they bowled. This was simple and the kids loved their shirts and had a blast. The best part was it was over and done within a few hours and my house was not trashed in the process! It isn’t gender specific, so we have done similar parties for both kids. For the invitation, I made circles on my word processing program (PAGES on my Mac) and filled them with black. I then typed the information inside one circle and the “announcement” in another using white font. I was able to fit four circles on each page (two invitations). I printed them out on white card stock and then cut-out the black circles with my circle cutting set from Creative Memories. I can’t say I’m very proud of these babies, but the good news is that we all get better with practise. 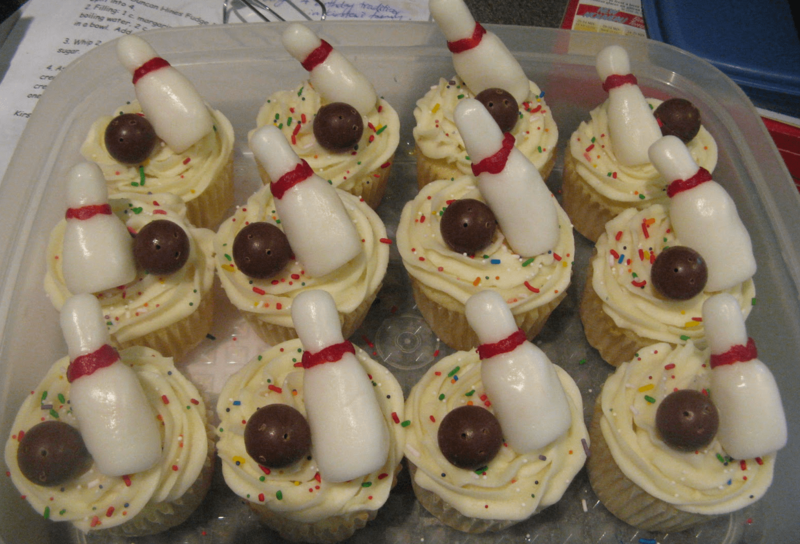 These simple cupcakes had poorly made fondant bowling pins. Can you believe the horrible job I did on the red stripe? The bowling balls were Whoppers with 3 “finger” holes punched in each. Nothing special, but the kids didn’t care. I found free bowling clip art on line and used the images to create personalized shirts for each of the kids. The top right corner on the front of the shirt had a small bowling logo with their name printed below. Shay’s also had “The Birthday Boy!” under his name. If you click on the image to enlarge it, you’ll also see the pop he spilled down his front! On the back of each t-shirt was a large bowling picture with the date printed below. Of course, the shirts were white and glowed in the dark. 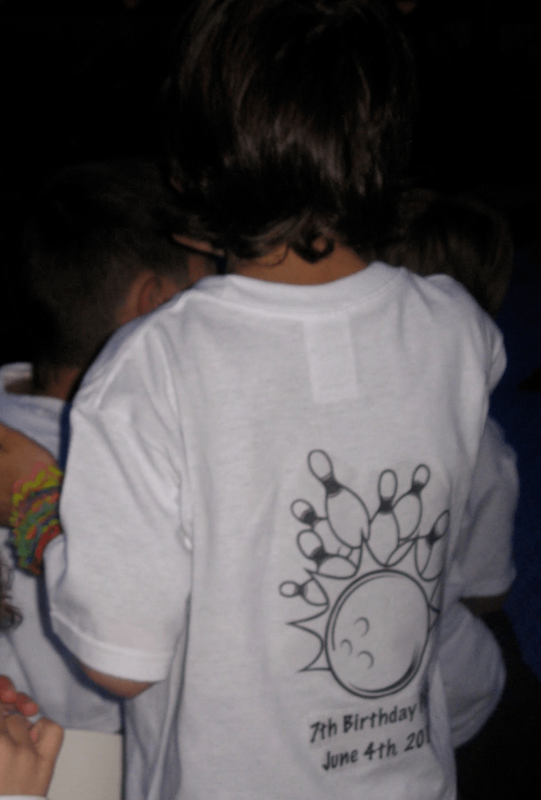 The boys were thrilled with their glow sticks and shirts and it made for an easy party. The shirts were made using t-shirt transfer sheets. I bought them at Michael’s using the 40% off coupon. You need to read the directions carefully as some instructions require you to print your document in “mirror” image. On my Mac, you do this once you press print and then select “layout” and “flip horizontally”. If you are interested in learning to blog, do not miss this opportunity to learn how the pros blog with a revolutionary new blogging platform. Click here to learn more. My son is certainly a fan of the Winnipeg Jets, but if truth be told, the Bruins would always be his first choice. He loves Boston! He has made a new friend this year and one of the things they have in common is their love for the Boston Bruins. 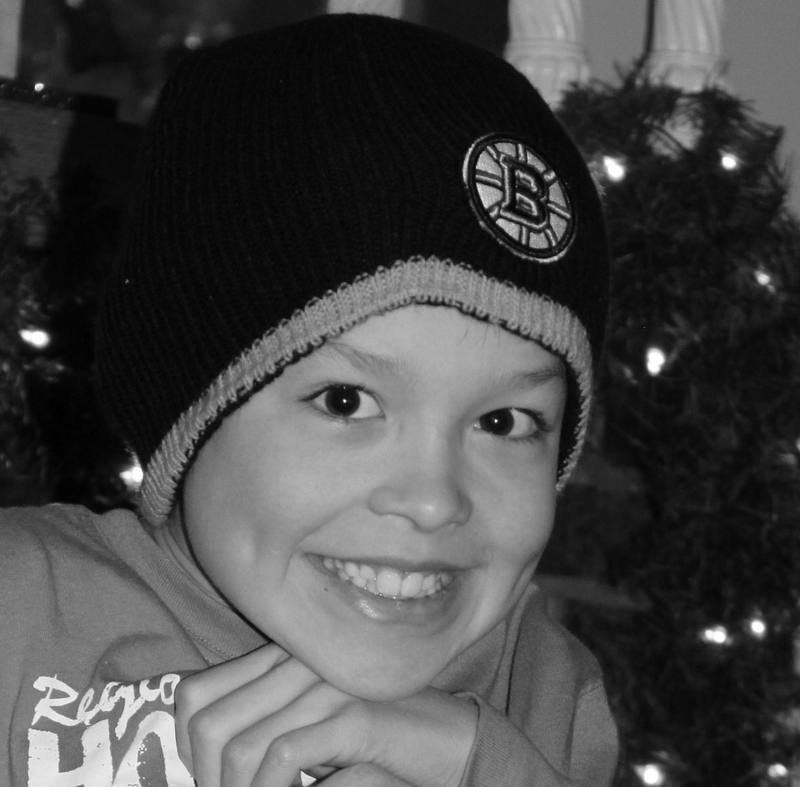 It is his birthday tomorrow, so Shay wanted to get him a Bruins hat or t-shirt. There isn’t much selection here, so I picked him up a Bruins hat and made a card to go with it. It turned out quite well and hopefully he’ll like it. Most of this card was really simple to do with lots of straight cuts and minimal measurements. I used a blank white card and added a black mat to the surface, leaving a very small white border around the outer edge. I then cut out strips of yellow, black and white and layered them across the middle of the card. I cut out a yellow circle and a white one that was slightly smaller. I then cut-out out 4 long narrow strips of yellow paper for the “spokes” around the “B”. I inked the edges of the yellow strips and then cut them in half to equal the 8 I needed in total. I placed the first strip horizontally across the white circle and it fit directly beneath the middle part of the B. For the other strips, I glued the ends, but did not put any adhesive under the center of the strip so that I could trim out the middle so that it wouldn’t be seen under the B. This also allowed me to line up the opposite sides of the strip perfectly using one long strip as opposed to two smaller ones. It was easy to mark the strips and then snip the center out. I did this for all of the remaining yellow “spokes” and then finally glued the B in the middle. I have to admit the B was the hardest part. I ended up pretty much making it by hand as I couldn’t figure out any other way to get the squared off style of B. I didn’t have a matching font on my Cricut, so I cut out a B that was similar in style, but much more rounded and then squared it off with scissors. I then cut a black ring with my Cricut and set the open black circle over the ends of the “spokes” and just inside the yellow circle. 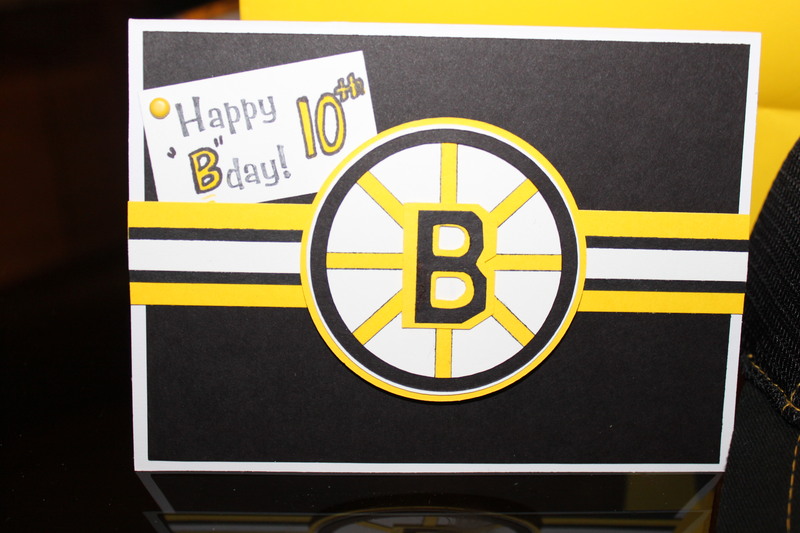 At first, I wasn’t sure how to make this Boston Bruins’ logo into a birthday card, but eventually decided to go with the term “B” day instead of birthday to tie the two together. I did a combination of stamping and hand printing to make the little tag for the top corner and attached it with a yellow brad. 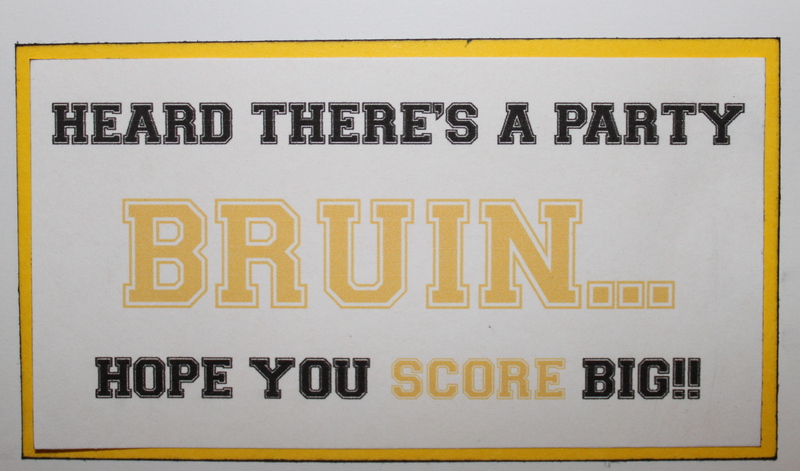 For the inside, I made up a little birthday greeting using a bit of a play on words with the Boston Bruins theme. I used a free font called Varsity to get that outline on the letters, similar to the font the Bruins use. Of course, I had to pick-up a yellow gift bag to pull it all together. I didn’t use any fancy ribbon or anything, but I think the yellow and black looks really sharp. I would have preferred to have either black tissue with the yellow bag or yellow tissue with a black bag, but I the dollar store didn’t have exactly what I wanted and I didn’t have time to go elsewhere. Hopefully, they’ll have lots of fun and he’ll have a great birthday. Have you ever considered working from home? A revolutionary blogging system has hit the market. If you are interested in learning how to blog and earn money from home, you need to click this link.